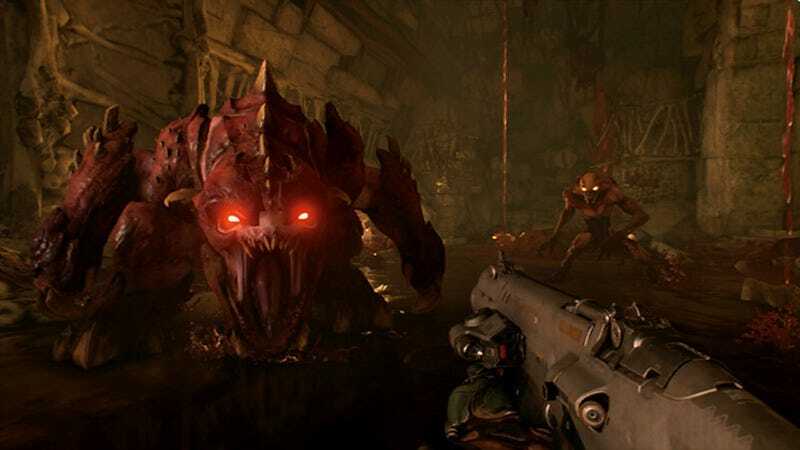 Doom does not perform nearly as well on the Switch as it does on PS4, Xbox One, or PC. On Nintendo’s latest console, Doom runs at a lower framerate, with big sacrifices in resolution and graphical fidelity. But really, isn’t it a miracle that Doom is on the Switch at all? This new port, out today, is the first of many big third-party games coming to the Nintendo Switch in the next few weeks including Skyrim, Rocket League, and L.A. Noire. The big advantages of these ports, as with all games on the hot new console, is portability. For the first time ever, you’ll be able to fight through endless waves of draugr and scream at homicide suspects on the go. I’ve played a few minutes of Doom on Switch, testing it both on my television and on the handheld, and it feels steady, if not quite as smooth as its console and PC counterparts. It runs at 30 frames-per-second, as opposed to 60 on the other platforms, and it looks significantly worse, suffering from the oh-so-common “vaseline on screen” blurriness that tends to plague games that are making graphical compromises just to be here. There are occasional framerate drops and a few other reported glitches, including music dropouts, and the text is so small that I assume it was designed for eagles. But it’s Doom on the go. It looks like Doom and feels like Doom and you can play it anywhere. Given what we know about the Switch’s processor, which is based on an Android tablet chip, it’s a miracle that this even exists.